Our understanding of carbene chemistry has advanced dramatically, especially in the last decade, and new developments continue to emerge. Some of the recent exciting findings have been collected in the first and second volumes of Advances in Carbene Chemistry. 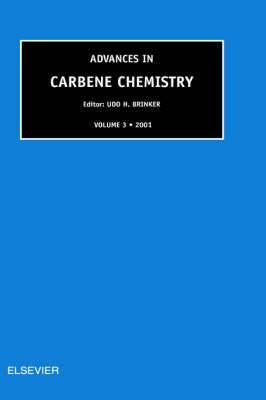 With the third volume, the series continues to provide a periodic coverage of carbene chemistry in its broadest sense. Beginning as chemical curiosities, carbenes are now solidly established as reactive intermediates with fascinating and productive research areas of their own. Five decades of divalent carbon chemistry have provided us with a vast repertoire of new, unusual, and surprising reactions. Some of those reactions, once classified as exotic, have become standard methods in organic synthesis. These highly reactive carbene species have been harnessed and put to work to achieve difficult synthetic tasks other reactive intermediates cannot easily perform. The fruitful relationship between experiment and theory has pushed carbene chemistry further toward the direction of reaction control; that is, regio- and stereoselectivity in intra- and intermolecular addition and insertion reactions. The interplay between experiment and modern spectroscopy has led to the characterization of many carbenes that are crucial to both an understanding and further development of this field.